Do's And Don'ts: Off-Season Nutrition! Most bodybuilding and figure competitors make their nutrition plans more complicated than they should be! Read on to discover the do's and don'ts of off-season nutrition to help you gain lean, healthy muscle mass! Most competitors make their off-season diets more complicated than they need to be. 200-350 calories in your off-season diet is all it takes to add muscle without adding fat. Doing 20 minutes of HIIT cardio will help you burn fat without breaking down muscle. During the off-season from competition diet and training what type of diet do you recommend? During this phase how would you recommend working out? This is a mind-bender, I think, for a lot of competitors as I think you get very hooked on being lean but need to allow time for your muscles to grow and get sufficient nutrients. This a great question as I think many competitors of fitness, figure, and bodybuilding can relate to it. Mind bender as you put it, is absolutely correct! With all of the misinformation being published these days about how someone should go about adding more muscle mass in the off season, it is no wonder that so many people are baffled by this concept of bulking and how one should go about doing it. I personally hate the term bulking because to me that just means indiscriminately putting on weight in any form and that usually that means getting fat. Although I think it is unrealistic to expect that someone should keep their body fat levels far below 10 % year round, especially women, I do think it&apos;s a huge mistake for competitors to allow their off season body weight to exceed over 20 pounds more then their competition or in season weight. I always encourage people to try and not let themselves get more then 10lbs over what their competition weight should be. I&apos;ve even heard of some pro bodybuilders advocating gaining as much as 60lbs or more over their competition weight in order to gain muscle mass during the off season! You see this type of thing printed in muscle magazines all the time. The important thing to remember is that this type of strategy is impossible to pull off successfully without an arsenal of chemical enhancements to crank up the metabolic rate well beyond natural limits. An athlete training without chemicals attempting this method of bulking would gain lots of fat and a little muscle from this (providing they weren&apos;t over training) but then lose all the muscle they gained from all the hard dieting it would require to lean out again. I have never been a fan of drastic dietary changes being done all at once whether you are trying to lose body fat or to gain muscle. The body thrives on equilibrium and there will always be negative consequences when that equilibrium is altered too drastically. If you cut calories too fast you will lose muscle, and if you add calories too fast you will gain fat. When you are trying to add muscle, don&apos;t be discouraged if you don&apos;t see your weight increase every single day. In fact if you do see your body weight go up every day then that means you&apos;re gaining fat, which is not what your aim should be. When You Are Trying To Add Muscle, Don&apos;t Be Discouraged If You Don&apos;t See Your Weight Increase Every Single Day. One pound of muscle contains approximately 800 calories. Now I know many people who will take in 1000-2000 calories over their caloric maintenance level daily in order to build muscle in the off season. Now we all know that building muscle is a slow process, relatively speaking, and with proper nutrition and smart training a natural athlete could put on between 5-10 pounds of muscle within 1 year. That is a pretty realistic goal. In the best case scenario, let&apos;s say your one of the lucky ones, you could put on 10lbs of actual muscle in 1 year. Since muscle growth will rarely exceed even 1/3 of a pound in one day and there are only 800 calories in 1 pound of muscle, then why would anyone need to take in several thousand calories per day above their maintenance level on a daily basis to gain muscle? The body will simply use what it needs for growth and maintenance purposes and then store the rest as fat. It is true that for each additional pound of muscle you add to your frame your basal metabolic rate will allow you to burn an extra 35-50 calories daily. After a gain of 10 solid pounds of muscle you could expect to take in an extra 350-500 calories per day in order to support that extra muscle without any fat gain. It has been my experience that you can increase your caloric intake by around 200-350 calories above your body&apos;s maintenance level daily and have enough calories above your maintenance level in order for your body to produce muscle at its most efficient pace without any significant fat gain in the process. I will be the first to admit that after months of hard training and dieting leading up to competition, when your competition is all over with it&apos;s almost like a reflex to want to trade in your chicken breasts, yams, and broccoli for pizza, French fries and ice cream! After your competition is over with I say go for it that night because you deserve to treat yourself after all the hard work and sacrifice you put forth. The hard part begins the day after the competition. Automatically you begin to think about foods you like that you&apos;ve been deprived of over the last 16 weeks or so, and you become filled with the desire to indulge. Speaking from experience, I can definitely say that the longer you go off your diet, the harder it will be to get back on it again. The wise thing to do would be to return to healthy, semi strict diet as soon as possible after your competition is over with to avoid rapid fat gain. I&apos;m not saying that you should go jump back on a pre-contest diet; however, you don&apos;t want to move drastically in the opposite direction either. Go ahead and trade in the chicken breasts for some steak here and there, go ahead and include an egg yolk or two in your morning veggie omelet or include a little more rice with your chicken for lunch. Have a bit more fresh fruit with your breakfast. Small dietary changes like this will give you enough calories to build the extra muscle you&apos;re trying to obtain without making you fat. I&apos;m not saying that you need to be perfect all the time either. I&apos;ve always been an advocate of including a cheat meal in your diet once per week. For myself, I like to do this on a Friday when I can go out for Friday night fish fry and treat myself to deep fried cod, French fries, and a couple beers. The day following my cheat meal day, I always plan one of my more rigorous workouts like a leg workout, so that I can take advantage of my muscles being stocked full of glycogen from my cheat meal the night before. This will usually result in a very good workout! Does Your Diet Have A Cheat Meal? As far as off-season training is concerned, I don&apos;t think that it should be all that different then pre-contest training. It is a common misconception that you should lift heavy weights with low reps to gain mass only, and lift lighter weights with high reps to get lean and defined. Many years ago I believed this to be true before I learned otherwise. At the time I practiced this strategy, it always resulted in me losing muscle, which would cause my metabolic rate to slow down and I would end up looking softer and less defined the day of my competition. What I&apos;ve come to learn is that building muscle is difficult because our bodies don&apos;t want extra muscle. To our bodies, more muscle is just extra maintenance, because literally every organ in our body has to work a little bit harder to support every extra pound of muscle that we have. With this being said, our bodies will lose muscle rapidly unless there is a good reason to keep it. 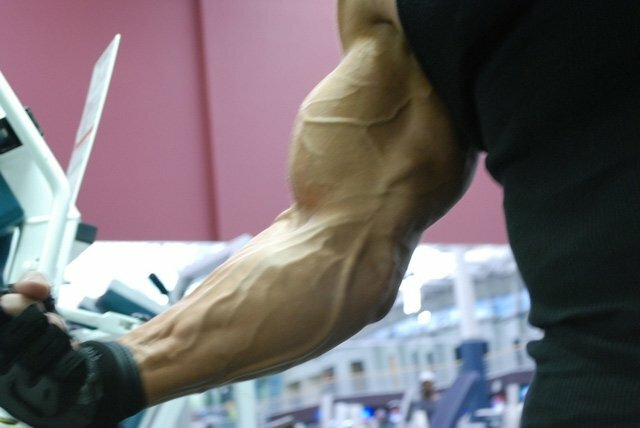 If you train with light weights and do high reps, then your body will let go of whatever muscle mass it can and only retain enough muscle to compensate for the stress of just lighter weights combined with the high reps. Your body does not require more muscle to do what it already has the capacity to do. The way to get your body to retain muscle mass you gain is to keep lifting progressively heavier weights because that will threaten the physiology of the body, and the body will compensate for that added stress by building and retaining more muscle. The Way To Get Your Body To Retain Muscle Mass You Gain Is To Keep Lifting Progressively Heavier Weights. As I mentioned before, the more muscle you have the greater your resting metabolic rate will be and the more calories your body will burn each day. At the time I made the switch to lifting heavier weights and doing fewer reps leading up to a competition, I experienced a leaner and much more muscular appearance on the day of my contest, and I began to place at the top of my class in every competition I did from that point on. Getting lean or cut is achieved through a strict reduced calorie diet, not by high rep sets with lighter weights and hours of cardio each day. Long, extended bouts of lower intensity cardio training doesn&apos;t really burn very many calories. So if long, lower intensity cardio doesn&apos;t burn many calories while you&apos;re doing it, just imagine how many calories it burns when you&apos;re not doing it! Long bouts of cardio training may cause your body&apos;s stress hormone to be released. For those who are unfamiliar, stress hormones produced by the adrenal glands are responsible for stripping away hard earned muscle and storing body fat. This method of cardio training is counter-productive. Doing 20 minutes of HIIT, high intensity interval cardio, training where you alternate high intensity and low intensity intervals about every other minute, has been shown to have a positive effect on increasing the basal metabolic rate without being catabolic and breaking down muscle tissue. You will accomplish more in less time this way. With that being said, I think in general most competitors make their on season and off season training and diet strategies much more complicated and exhausting then they need to be. A diet that results in calorie deficit does not necessarily mean a quality diet, but it does mean weight loss. In my opinion all quality diets share some characteristics. Why is that? It&apos;s not easy getting lean, which is why fast fat loss is always a hot topic. So to get you on the rocket ship to ripped, here are 5 fat-loss blast-off tips - from diet to training. Seven Day Fat Loss Meal Plan! Here is a sample diet to please to the masses. This one provides approximately 2300-2400 calories, 45% carbs, 35% protein, and 20% fat. Try it out and see if it works for you.